Current bargain heel favourites | S J M W E L L - Fashion, Beauty & Lifestyle blog. After having a big old browse in Primark the other day, I spotted these little beauties and decided to try them on! 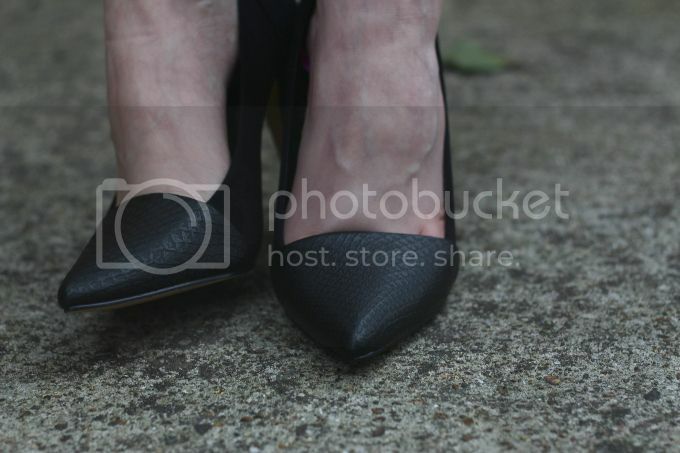 I was after a pair of simple black go to heels that (for once) were not platforms, all the ones I have already are platform or a thick block heel. I wanted more of a simple but elegant heel that fit's nearly all occasions, from dresses to jeans. I think these bad boys tick the boxes. The two textured heel grabbed my eye and I picked them up. They also have them in cream and also silver. They seemed popular by a lot of people judging by the shelf and the fact a lot kept picking them up. I'm not surprised, at £12! it's a deal, steal and a beautiful one at that. As I said, I'm use to the ease of walking in platform heels being one height and wasn't sure of how simple the adjustment to these heels would be. These are nice and half easy to walk in, all depends on how you are personally walking in heels! Do you like these? Have you seen anything in Primark recently that took your eye? These are really gorgeous! Doesn't look like Primark at all. Are they comfortable?! I love these! They don't look like primark, I'd have thought Zara or somewhere! Love them!